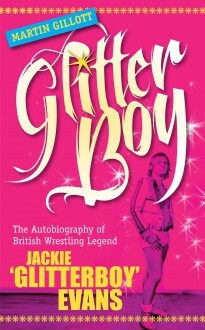 Martin Gillott, better known in the wrestling world as Jackie ‘Glitterboy’ Evans, knew early in his career that life in the ring would be no walk in the park. Posing as a blond, Lurex-clad gayboy who liked to fight dirty was great for ticket sales, but not so good for his health. He was knocked out five times in his career – always by a furious fan, never by his opponent. Yet Martin loved the game, and wouldn’t change a day of his 12-year professional wrestling career. Now he tells all, including hilarious accounts of adventures in and out of the ring, fans violent and amorous, landladies who were scarier than Giant Haystacks and girls who were faster than Mick McManus. And then there were the many well-known names he rubbed shoulders with along the way, from Brian Glover to John Le Mesurier. Confessions Of A Wrestler will have you in stitches – just like ‘Glitterboy’.